There is certainly a rising trend of apps in the culinary and mixology space that are clamoring for a bit more mindshare among Millennials, but what are apps in this category doing to connect people among their own friends? There isn't much when it comes to most transactions with apps and their interactions with smartphones. Going out to bars, you see people holding a drink in one hand, and a phone in the other. They are constantly checking for new texts, Facebook updates and Tweets from people who aren't actually standing in the room with them. People are more connected to their phones than their surroundings - and there is an easy way to fix that. A solution to help cure the Fear of Missing Out syndrome that has ailed Millennials for years now. As our generation feels more and more overextended trying to balance work, family, friends and social obligations, we need more ways to connect great times with great people and get rid of FOMO forever. So to answer for some of that social anxiety, Jägermeister developed its mobile app to streamline social networks among friends, and create "tomorrow's legends tonight" with a memorable highlight reel that captures the night out. 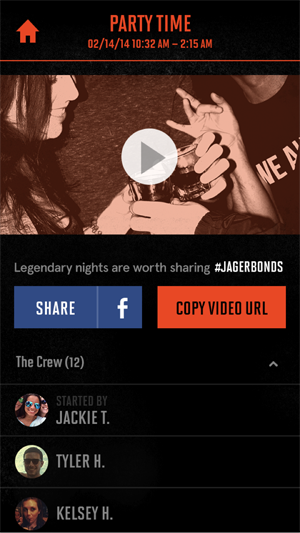 Jägermeister's new Jagerbonds app captures and transforms images and video content from Facebook and Instagram from multiple users into one video highlight reel of a group's night out. Everyone you're out with (or want to connect with) can download the app and begin posting photos and videos to their social networks as usual. The result: a short video of the night set to music that you can share online (or keep for your group's eyes only). So cheers to that. Kate Laufer is a Director of Influencer Marketing and PR at Sidney Frank Importing Company, which represents Jägermeister. She leads brand public relations, corporate communications, celebrity and influencer relations and product placement in film and television for the company's portfolio.